The Chinese space exploration program is well under way. It is perhaps the most ambitious Chinese voyage of discovery since Zheng He set sail at the beginning of the Ming dynasty. Chinese Space pioneer, Wang Xiji has proclaimed that space is the ‘Fourth Great Territory’ after land, sea and air. In the early years of the People's Republic, China followed its then ally the Soviet Union which had put Sputnik ➚ into space in 1957. The Sino-Soviet split put paid to a joint development plan and China shelved its program until 1967. Then, when the space race between the USSR and USA was at its height, China, rather quietly, continued rocket research and on April 24th 1970 China launched its first large satellite into orbit Dong fang hong yi 东方红一号 The East Is Red One. This was followed up with an ambitious project Shuguang One 曙光一号 which aimed to launch people into space, however it was shelved in 1972 amidst domestic political turmoil. The next project concentrated on improving rocket launch technology. It did not have an exploration mission. The Long March rocket ➚ program (长征系列运载火箭) began in the 1980s and succeeded in launching a number of Chinese satellites. It also launched satellites for other Asian states as a commercial venture. It commemorates the Long March of 1935. The new Long March 7 rocket will carry cargo to the new Tiangong 2 space laboratory in 2017. A significant impetus to China's space ambitions began when the China Aerospace Industry Corporation (National Space Bureau ➚) was founded in June 1993. By 1999 it had created a long term plan for space exploration and development. Project 921/1 was then renamed Shenzhou 神舟 meaning roughly Ship of the Heavens. It has progressed step-by-step, proving the technology is reliable before moving to the next stage. It was on 15th October 2003 that China launched Shenzhou 5 ➚ - its first manned orbit around the planet. The Chinese astronaut, Lt. Colonel Yang Liwei, spoke of China's ambitions in Space exploration with the aim of a moon landing. China had become only the third country to put people into space. The next rocket launch in the program was Shenzhou 6 on 12th October 2005 when two men were put into orbit for five days, returning safely to Earth. In 2008 Colonels Zhai Zhigang, Jing Haipeng , and Liu Boming undertook China's first three man mission in Shenzhou 7 神舟七号. The first mission under the Chinese Lunar Exploration Program (called the ‘Chang'e’ series) was the unmanned Chang'e 1 which was launched on October 24, 2007 to orbit the moon (the 5th nation to do so). 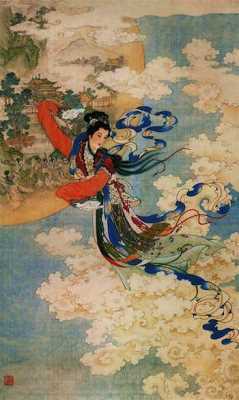 It is named after Chang'e 嫦娥 after the Chinese goddess of the moon. It has made the most accurate map of the moon's surface ever produced during its 5,514 orbits before being deliberately crashed onto the Moon's surface on 1st March 2009. Part of the plan is to build a Chinese space laboratory on the lines of the International Space Station ➚. On September 29, 2011, China launched Tiangong 1 ➚ ‘Heaven palace’ its first space lab, which has now been superseded by Tiangong 2 ➚, in 2016. An even larger space station is planned to be put in orbit 基本型空间站 Jī běnxíngkōng jiān zhàn in 2020. Chang'e 3 嫦娥三号 landed on the moon on 14th December 2013. It launched a rover called ‘Jade Rabbit’ 月兔 Yùtù that trundled around for a day or so before suffering an electrical failure. The rover is named after the legend that a rabbit lives on the moon. In October 2014 an unmanned satellite ‘Xiaofei ➚’ orbited the moon and came back safely to Earth. The mission of Chang'e 4 was to land on the dark side of the Moon and send out a rover to investigate this forever hidden surface. It touched down on 2nd January 2019 ➚. The Yutu 2 ➚ rover has performed well and is now performing experiments such as growing plants in space for the first time. Cotton was the first plant to sprout ➚. It also has an orbiting lunar satellite 'Queqiao' launched in May 2018 that relays the information and commands from the lander and rover. This was a test of Chang'e 5 - scheduled for launch December 2019 ahead of a manned mission to repeat the same journey. Chang'e 5 ➚ is due to make an unmanned moon landing and bring back 4 pounds [2 kgs] of soil samples to Earth in 2019.Chang'e 6 scheduled for 2020 is planned as a back up mission for Chang'e 5 should it fail and will perform the same tasks. Although there is no officially announced project or dates it has been rumored that China will seek to land people on the moon in the next five years, with maybe the establishment of a permanent settlement. So far Chinese exploration of Mars is at an early stage although a Mars rover was been designed and demonstrated at Shenzhen in 2014. In 2020 a probe to orbit Mars is due to be launched ➚. Further plans are expected to be revealed after the manned lunar project has been completed. Tianjin has the Binhai Enterprise Zone center for research into space technology and the Harbin Institute of Technology has been traditionally strong in rocket and space technology. China has a number of rocket launch centers. Jiuquan Satellite Launch Center, Inner Mongolia is the oldest and most heavily used; it launched Shenzhou 5 to Shenzhou 9. The Taiyuan Satellite Launch Center, Shanxi is mainly used for ballistic missile launch testing; while the Xichang Satellite Launch Center, Sichuan has launched satellites in the past including Cheng'e 1, but is to be superseded by the new Wenchang center. Wenchang Launch Center ➚, Hainan is the latest launch center to be developed. It is built on the coast allowing transport of the huge rockets by sea rather than over-land. Because it is so far south, nearer the equator, it will be able to launch heavier payloads into equatorial orbits. China has had ambitions to build large solar power stations ➚ in earth orbit that would then beam microwave energy to static receivers on Earth. The materials to build such satellite power stations could be mined from the moon and so avoid the huge expense and danger of launching them from Earth. Citation information for this page : Chinasage, 'China's Space Program', last updated 16 Jan 2019, Web, http://www.chinasage.info/spaceexploration.htm.